Yes, that's me! Not many years back, but long enough that they weren't doing colored prints. 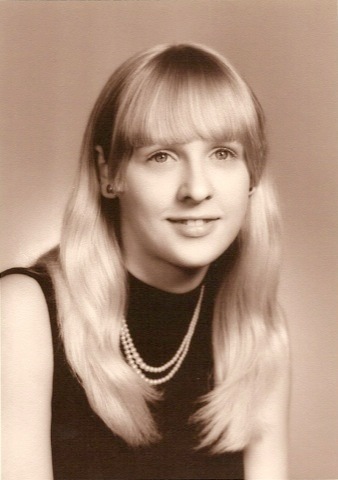 I'm glad age doesn't have anything to do with how old you are, because I'm only a few years older than this picture in my mind. What a delight to get to see a Yellow-billed Cuckoo one morning. I looked out the breakfast area window and noticed a bird on a branch that didn't look like one of the "regulars." I got the binoculars nearby and realized it was a Yellow-billed Cuckoo and grabbed my camera. It's really rare to see one of these birds which inhabits woodlands with dense vegetation and is quite secretive. It's much easier to hear their song. I wanted to know more about the bird even though I had two previous experiences with one, so I decided to study a bit and write a post with a link to its song. Maybe you have them in woods nearby where you live. Post: Yellow-billed Cuckoo. Although we've definitely had summer weather for the past week, the evenings cool off and it's such a delight to sit on the screened porch and enjoy the fireflies. What a God! He wanted to make us laugh and be filled with delight over bugs that have their fannies light up. How creative can you get!? I've always said that the Carolina Wren was my favorite bird because he would sing so loud and dance on the deck post early in the morning like he was praising the Lord. They're an early to bed and early to rise bird which is our lifestyle also. The dance was always accompanied by flipping of the tail. I've had neighbors, who really have no interest in birds, ask me if I knew what kind of bird is loudly singing outside their bedroom window in the early morning. It's a pleasure to let them know that it's a Carolina Wren, which is another reason I love this bird. It seems to get non-birders to think it's something special. Maybe he's sharing the Gospel in his songs. 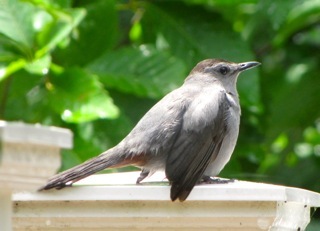 I took the first picture of a Gray Catbird here on our property in May of 2009 and it captured my heart! I've been taking photos ever since when given an opportunity. 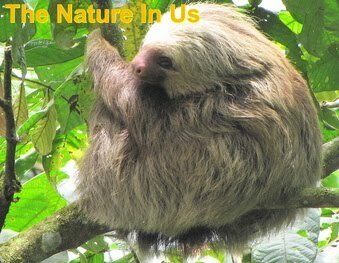 Since they love bugs, they're usually in a tree or bush or undergrowth. The male sings throughout the day and is a mimic similar to the Mockingbird. Catbird songs can last many minutes and include more than 100 different sounds. You can tell a catbird's song from a mockingbird's song by the number of repetitions in a row. A mockingbird will repeat a phrase or sound 2-6 times in a row, but a Catbird will use each phrase once and may include a meow at the end. They go hopping around the property in search of bugs until the female must remain on the nest. Then he sits nearby and softly sings to her. How sweet! I took a short video of the Catbird cleaning up after a rain shower. 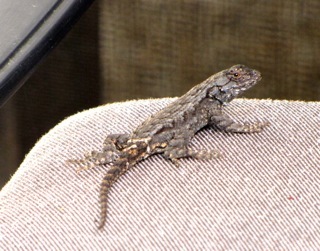 We've had an Eastern Gray Fence Lizard dwelling on our deck for about a month. I am beginning to think it's a male and he has this area designated as his territory. He's still a young one, not even half the size of the adults, but a real cutie. He likes the loveseat on the deck which is up against the screened porch. He can hang from the screen and dive bomb bugs. He runs under the cushions if I get too close for comfort. We see a lot of Five-Lined Skinks on the deck, but not usually the lizards which seem to prefer the rest of our property where they can play hide-and-seek with me by running around trees while I try to get face-to-face with them to chat. I see them scurrying about a lot and am excited to have a habitat they enjoy. We have portions of tree trunks trees that neighbors took down. We take these "stools" (cut trunks) to provide a nice sitting spot at various places around the yard and as they deteriorate the wildlife love them. The lizards and skinks love to get behind the bark as it loosens and as the center of the "stool" begins decaying they have a great place to lay eggs within the trunk. The woodpeckers are on them to eat all the bugs. We don't cut down our dead trees since the woodpeckers need them for nesting and we need the woodpeckers to keep our healthy trees healthier since they eat all the possible bad bugs in them. We are blessed to have six species of woodpeckers: the huge pileated woodpecker, red-headed, red-bellied, downy, hairy, and the northern flicker. Wonder how many bugs they all eat a day? I love watching all the things going on beyond my screened porch domain, like the continual bathers at the bird bath. It's been a busy year for that because we have a lot of Tufted Titmouse birds coming to bath many times a day. They love bathing and line up to wait their turn. Sometimes I need to add water to the bird bath by the afternoon. They are always chattering like siblings. Do you know that they are related to Chickadees? 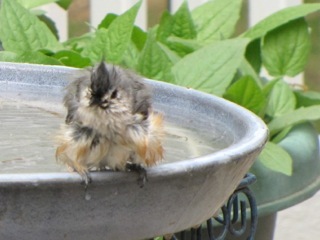 View Video of Titmouse Bathing. The little fellow wants a chance to show you that he cleans up well and has a stylish hairdo. Photo: Tufted Titmouse. Have you considered planting a Black Willow tree? We had one that needed to be cut down. Such a sad event for me being such a tree lover. What makes it even sadder is that I made myself feel better about it because we were going to cut the branches into little logs to make a border for a flower bed. Now, two months later, the little logs are trying to become willow trees again and there's no water in the area other than rain. To see their desire to live and grow again brings a sadness to my heart. 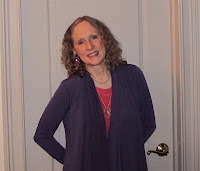 I wrote a blog post about it all: Tenacity of a Black Willow Tree. When I consider how big that makes my God, it makes me grin to realize that if all our waters are held in His palm, and all of heaven can fit in the span of His hand, then my God is bigger than this whole universe? So He would naturally be everywhere at the same time. Sometimes the mind cannot grasp what the spirit is speaking. This makes me think of Jesus' return to the earth since it says all will see Him. "... they will see the Son of Man coming on the clouds of heaven with power and great glory" (Matthew 24:30). The 27th verse says it will be "as the lightning comes out of the east, and shines even unto the west; so shall also the coming of the Son of man be." I've heard many times that one of the reasons we know we're in the end times is that we now have the technology for the whole world to be able to see Jesus as the Bible says we will. Kinda silly when you look at that in the light of who He is and how big He is. That's what makes it even more amazing how God had to confine Himself in a human body to come to earth. Oh how much He loves us to leave the glory of Heaven and suffer so greatly so He could again have intimate relationship with us. What is your definition of eternal life? For most of my life I thought it was what I would live in Heaven; it's what you get when you get saved to escape Hell. Jesus tells us exactly what it is: "And this is life eternal, that they might know thee the only true God, and Jesus Christ, whom thou hast sent" (John 17:3). Eternal life begins the day we were saved and is all about knowing God, not living forever. How about this!? Research shows that reading improves mental well-being, and reduces stress levels by 67% (Mindlab International, 2009). Reading also reduces the risk of dementia by 35% (New England Journal of Medicine). I keep a spiritual book on my nightstand to read a few pages before going to sleep at night. Then as I drift off to sleep I generally quote Psalm 91 and rarely get to the end. I've read in other research of the brain that whatever you are thinking about when you're going to sleep is what your brain will magnify during the night. So you don't want to be pondering the day's problems only to wake up feeling like they're a bigger burden than the day before. Think on Good Things When You Go To Bed! Share this link with them!